It’s time to hit up your dollar store for shaving cream! I picked up five cans the last time I was there and we’re already putting it to great use. 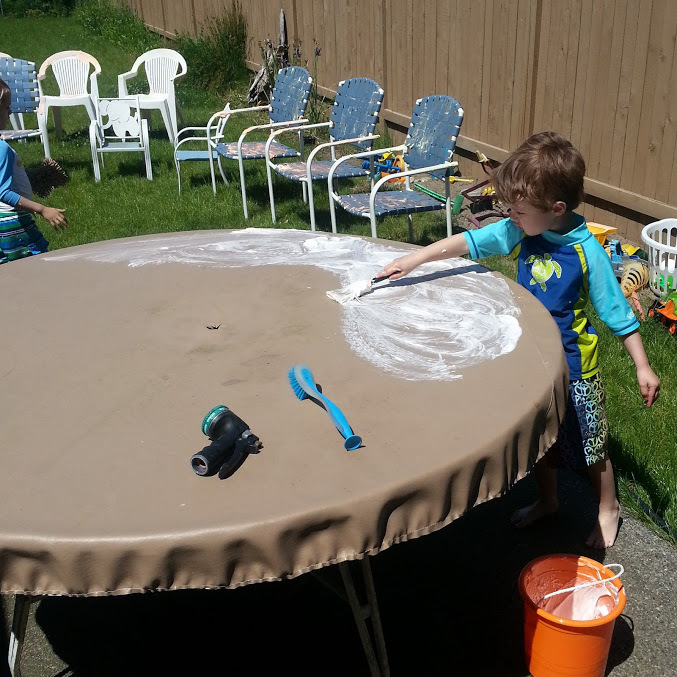 We pulled out all our summer furniture and put the boys to work “painting” and cleaning the dirt off the furniture. 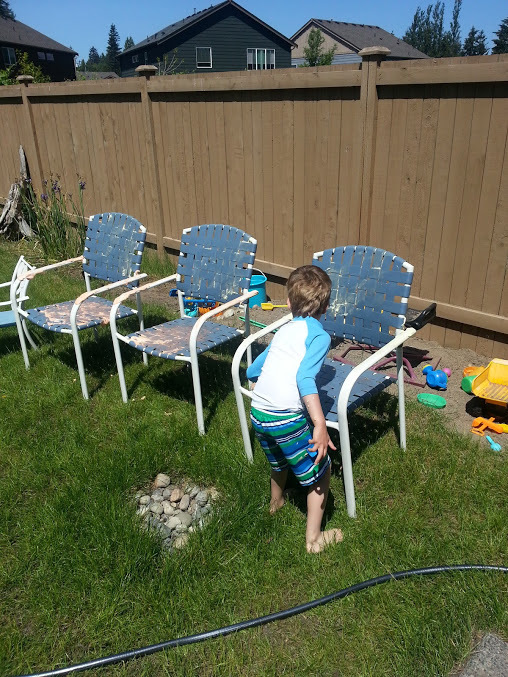 I gave each boy a bucket with shaving cream mixed with a couple drips of food coloring and a large paint brush – away they went, painting all the furniture with shaving cream. It was great fun and a good start on getting everything scrubbed up and ready to use for summer. I was amazed at how long they kept at it, I thought they’d lose interested but they kept asking for refills on their “paint”. 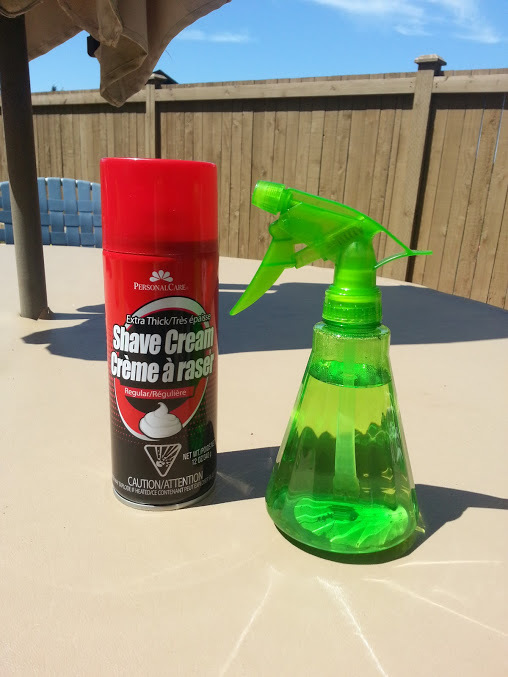 Yesterday I pulled out our dollar store water bottles and shaving cream again and made spray targets for the boys. The LOVED it. It was a cheap way to get some fun outside and a bonus of working on strengthening their hand muscles for writing and working on hand / eye coordination. I love squirt bottles so much better than traditional water guns. First of all, it’s not a gun, so I feel better watching them squirting everything. Plus they were only a buck at our Dollar Tree. Plus you can adjust the spray to have either squirt or mist – which makes for a fun way to mix things up when you get into a water fight. Time to stock up on your own back yard fun! 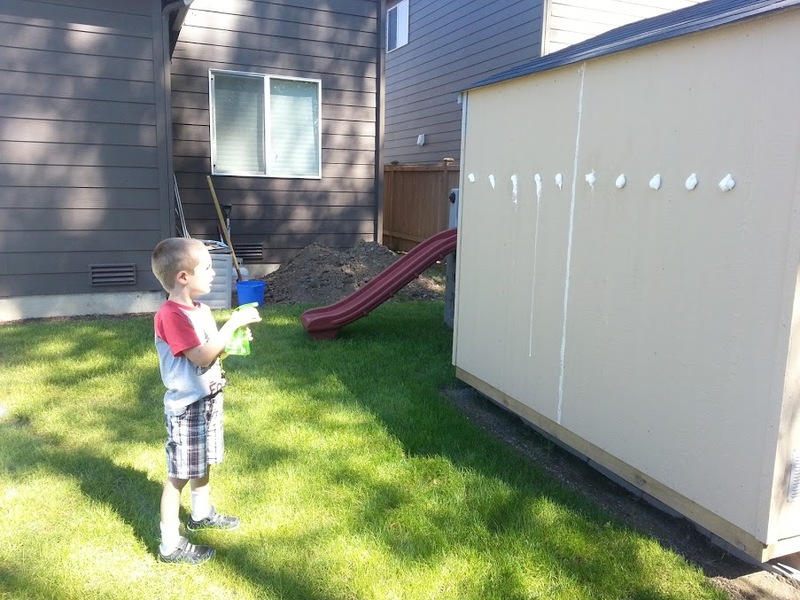 Some more ideas: You can draw targets on paper and hang them with painters tape for spraying. Or put colors in the water and spray art. 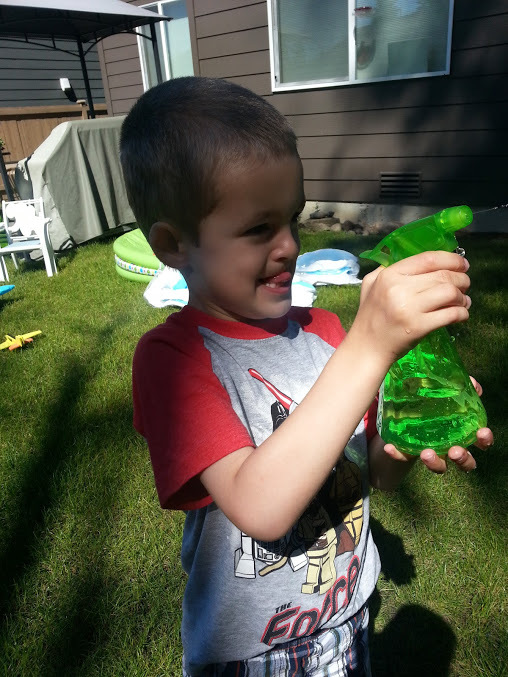 Or do what we did and mix color into the shave cream for easy, messy fun outside. A spray with the hose will clean everything up. You can also bring the shaving cream inside and mix a bit with tempra paint for indoor painting on paper. It makes the paint go a bit farther and for Alice it makes a nice foamy paint to work with that doesn’t drip everywhere and make as much of a mess as straight tempra paint does.